BOSTON, Mass., Feb. 3, 2012 (SEND2PRESS NEWSWIRE) — Mr. Ray Michaels, founder of Localization, LLC, has recently announced that the sluggish economy has forced companies to look into Canadian, European, Asian and South American markets and while they are working on that French pronunciation, managers now come to Localization, LLC Translation Services for translation and language support. Some companies are starting to increase their exports, others are making efforts to broaden their client base domestically; in both cases, the companies are targeting non-English speaking customers. The greatest demand at Localization, LLC Translations Boston are Spanish and French translations. “Which makes sense,” says Ray since Spanish is spoken throughout North and South America and French speaking Canada is only 5 hours away. When asked about all the available automated translation such as Google Translate and Babel Fish, Mr. Michaels also adds that he doesn’t feel translators and language professionals should be threatened by technological advances. “Translation industry has evolved into a very diverse industry with services that may not come to mind right away when thinking of translation,” says Ray. “To begin with, the automated translations have a long way to go in terms of accuracy and language grammar. They haven’t yet learned how to decline or conjugate so that’s why I always advise our clients to use these tools for personal needs such as translate an email or sentence or two. Do not use it if the translated document will be published or seen by others. It’s dangerous because you never know what that machine translation can create: it could be offensive and expletive. Companies spend years building their reputation – machine translation can destroy it in seconds. And machine translations would never learn idioms, jokes and the overall spirit of the written text,” adds Ray. Localization, LLC Translations Boston is a full service translation company providing comprehensive translation, localization and multimedia services in over 50 languages. With offices in Boston, Massachusetts, Localization, LLC Translations Boston are much honored to provide language services to our clients in Boston, Chicago, Washington D.C., San-Francisco, London, Mexico City and Paris to name a few. More information: http://www.localizationllc.com . 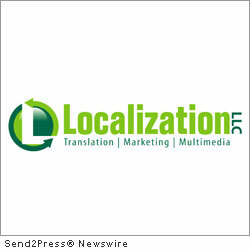 News Source: Localization, LLC :: This press release was issued on behalf of the news source by Send2Press® Newswire, a service of Neotrope®. View all current news at: http://Send2PressNewswire.com .